This all started when Joe Griffin mentioned on the CP Listerver that he had received seed of P.elongata from someone in Colombia. 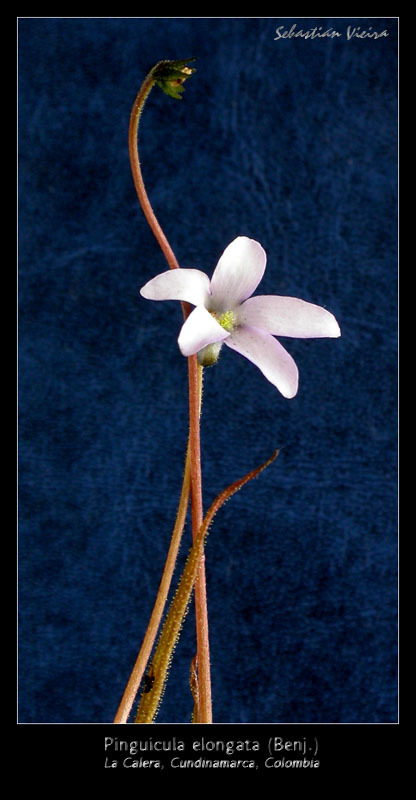 I immediately e-mailed him asking if he could put me in contact with the person who found P.elongata in the wild as I also live in Colombia and would love to go and see this plant in nature. 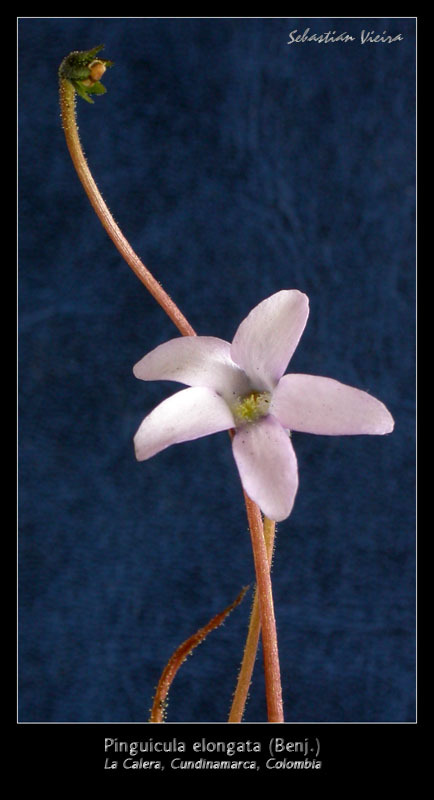 This is how I contacted Heberleyn Hernandez in Bogotá and learned that he found a good population of P.elongata some time ago. 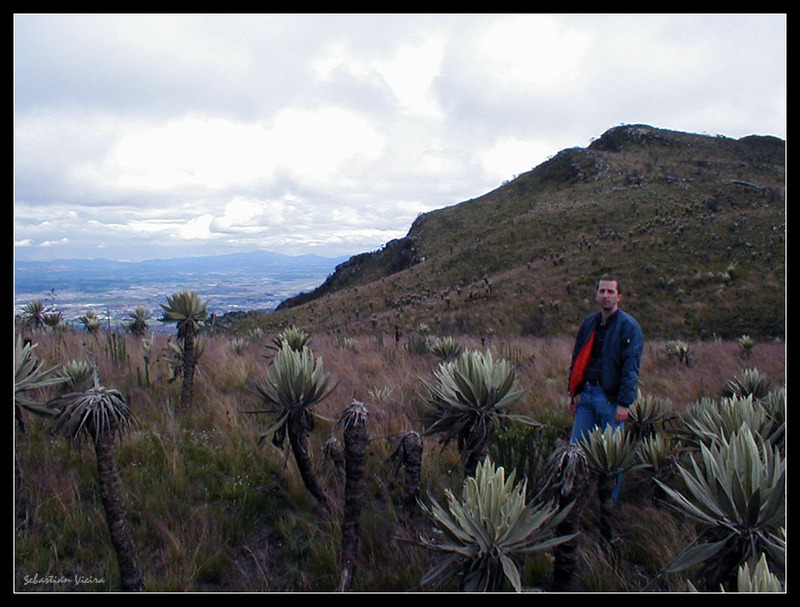 In May 2003, I had to go to work in Bogota for a week and I called Heberleyn to see if he would like to go to see P.elongata with me during the weekend so on 24th May 2003 I finally was able to visit this place. From Bogotá we took the east road to "La Calera" and just a little time after the road passes the top of the hills east of Bogotá, we took a dirt road to the south. This road is the access to some country houses and at some point we parked and took a path leading to the top of the hills. 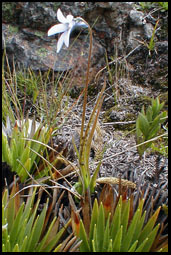 It was a hard hike as we had to climb about 200 meters and starting at 3000 meters over sea level, oxygen was scarce and I felt my lungs were going to explode; add to this the excitement of knowing I was going to see P.elongata and you can possibly imagine how I felt. About 40 minutes later we arrived at the top of the hills. What a magnificent view, to the west you could see a good part of Bogotá city, and to the east just valleys and mountains but what I liked more was looking at the "paramo" habitat. 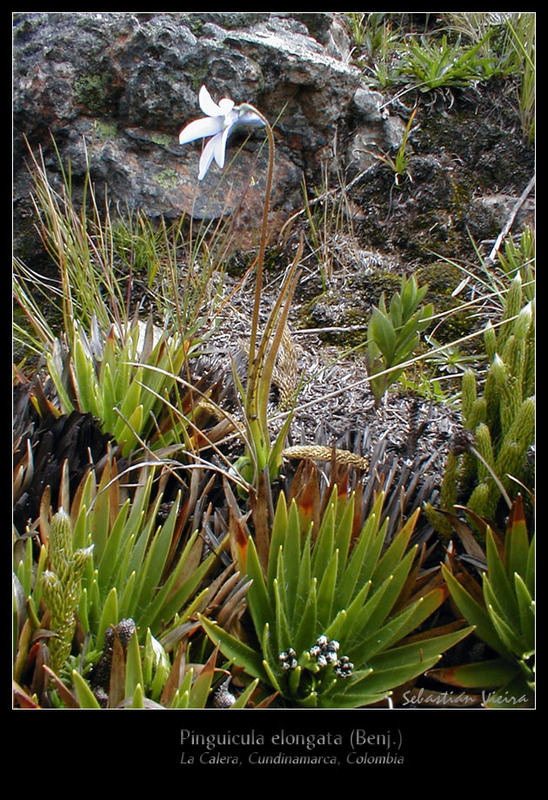 It´s the kind of habitat you can find in the tropical andean mountains when you are over 3000 meters. It is the last kind of habitat you find when climbing, because if the mountains get higher you will only find snow. 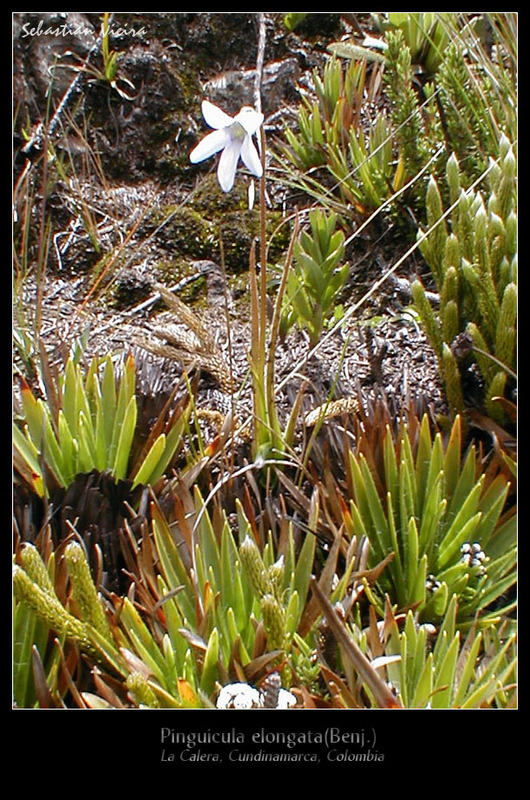 The paramo is composed of grasslands and some other short plants, but the more characteristic plant is the "Frailejón", a plant of the genus Espeletia which grows very slowly at a rate of just one to three centimeters a year and can reach heights over two meters where the habitat has been untouched for centuries. 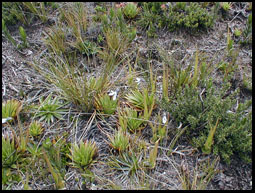 At this place there were some nice 1.5m plants of "Frailejón" scattered around the grasslands and this is a good sign showing that this habitat has little human influence, a good thing for our loved Pings. 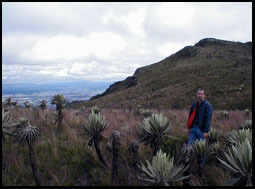 This is me and some "Frailejon" (Espeletia sp.) plants. You can see part of Bogotá city at the back. 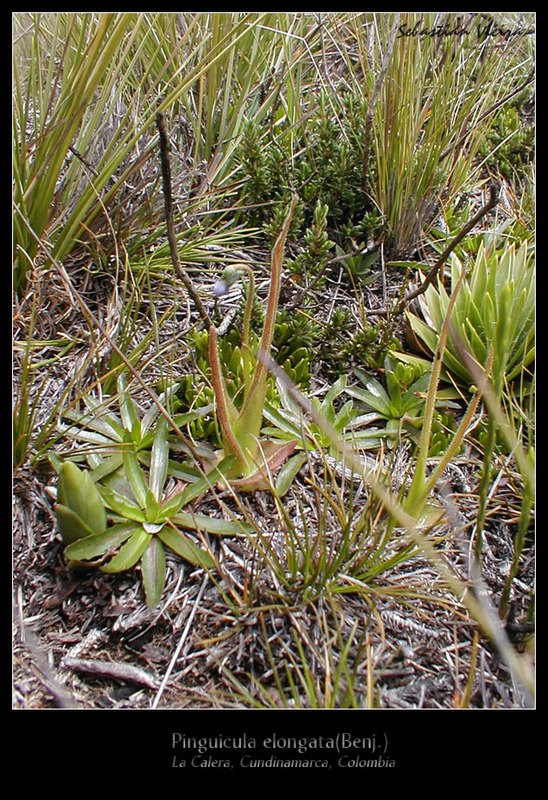 Some of the nice plants growing at this habitat. We walked sometime following the top line of the mountain and I could see there were places with very soft , almost unnoticeable depressions where the grass was absent and you could see the bare peaty soil covered with scattered small plants of different kinds. 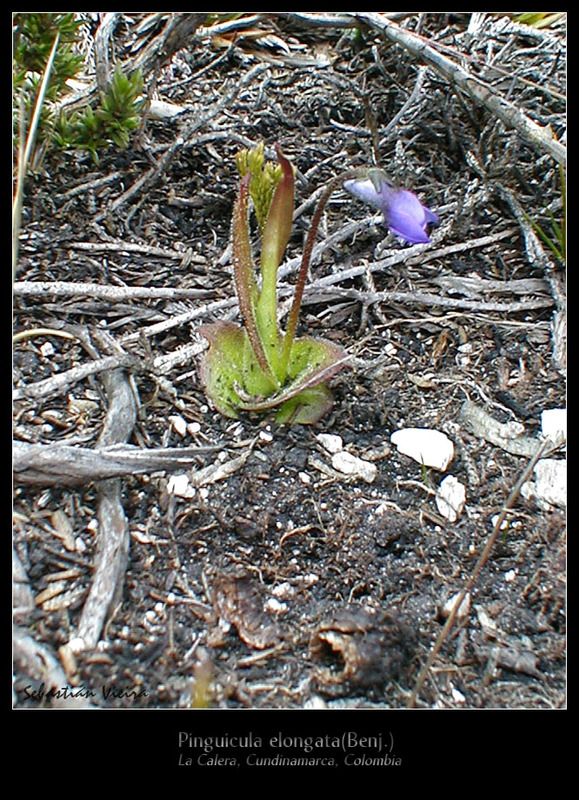 At some point, Heberleyn called my attention and told me "there they are", my heart pumped of excitement while I tried to spot the P. elongata plants, and indeed, there they were. At the beginning difficult to spot because there are lots of small plants at this place but after a while my eyes learned to differentiate them and YES!! 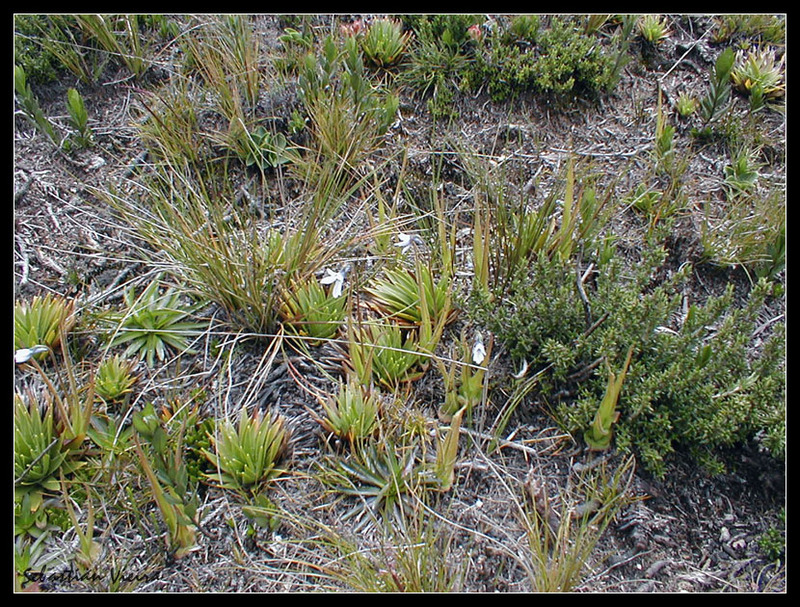 !, there were lots of plants of P.elongata; wonderful green and pink rosettes. But what excited me more was that most plants were blooming. 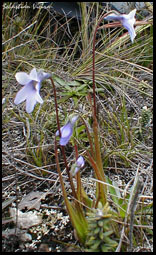 You could see lots of this small white and light violet flowers scattered around the place. Also notable, is that the plants have two kind of leaves. 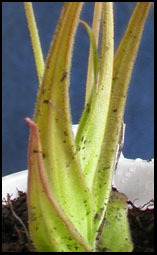 The oldest leaves at the base of the rosette, are wider and shorter, and stay flat aligned with the soil. 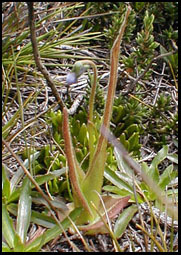 The second kind of leaves, are the erect elongated leaves, with pink tips that gave this species its name. 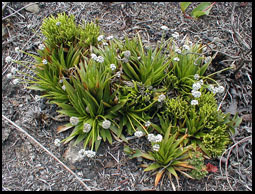 Usually you will find that plants only have two or three of the flat leaves, and all other leaves will be of the elongated kind. 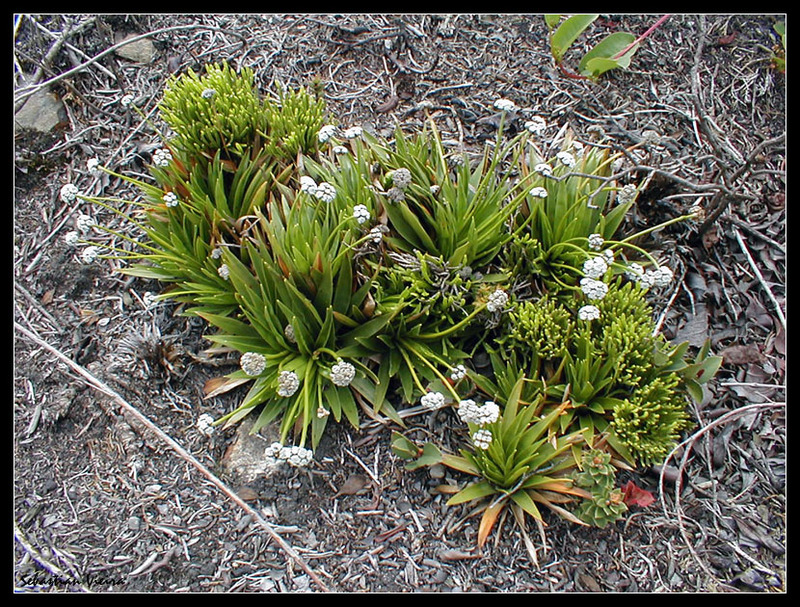 Scattered plants of blooming P.elongata. 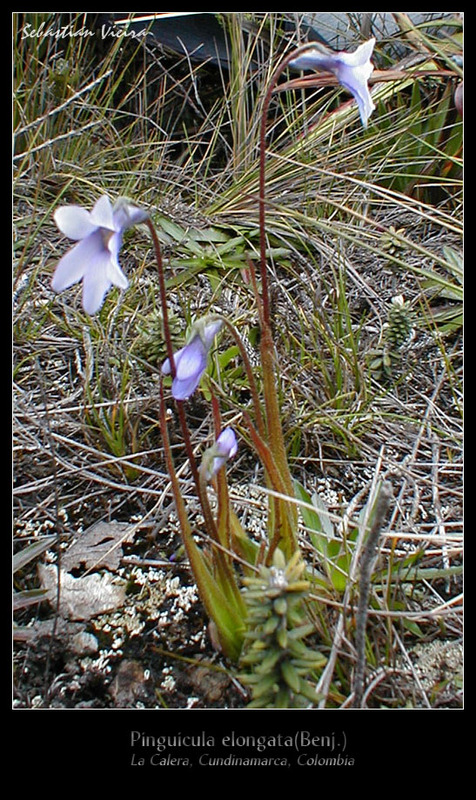 There were plants with white flowers and others with very light violet flowers. I think the color of the flowers changes with their age, starting violet and turning white when they get older; as I could see that unopened flower buds had a stronger violet color. Most blooming plants had a second developing flower stalk and some had a third one so I think the blooming season was just starting and was going to last for at least one month more, until the rainy season ends and the dry season starts. Based on this, I imagine the seeds are released during the dry season which lasts from July to September and will get a dry and cold stratification as the coldest nights in these mountains are during the cloudless, dry season nights. At this time of the year, the plants (and seed) will have to withstand light frosts during the nights. As Heberleyn told me, the plants bloom again at the end of the year, in November and December. This again, is the end of a rainy season that goes between October and December, and the seeds will again be released at the start of a dry season going between January and March. This might explain why those who have tried to germinate P.elongata seed, have had no success until now. 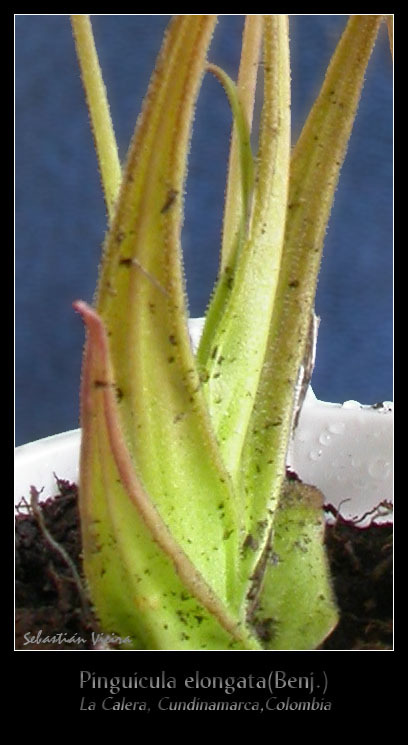 Notice the stronger color in developing flower buds. 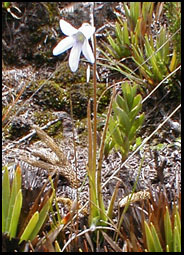 And the almost white color of older flowers. It was 9:00 in the morning and temperature was at 16.4 celsius degrees. I could feel a strong wind coming from the east that made taking pictures of the flowers very difficult as they moved to one side and the other and the digital camera I brought did not offer the possibility to manually set the shutter speed. With this strong winds blowing all day the relative humidity must be low, raising only at dawn, when there is no wind and this mountains are covered with clouds. I digged a little with my fingers and noticed that the soil was slightly moist and was composed of peat with a small quantity of sand. 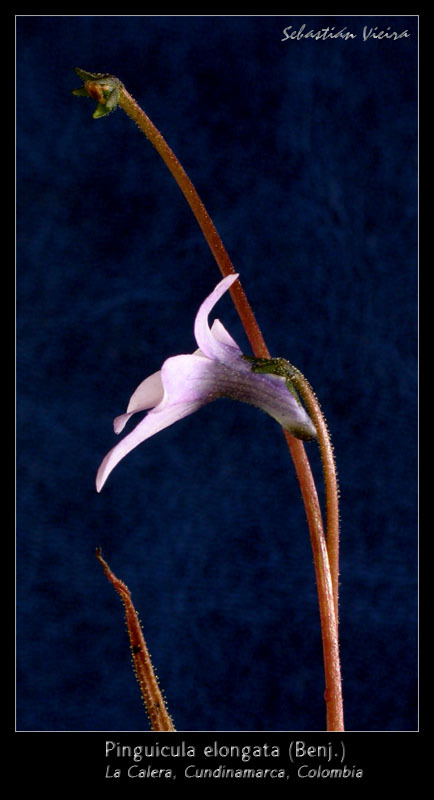 As the plants grow in places with small plants and almost no grasses, they will get full sun all day long, and this is what gives them their very nice pinkish color. We stayed there for some time, taking pictures and looking at the plants. 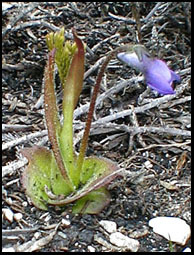 Most plants had a good amount of captured prey, composed mostly of dipterous insects (small mosquitoes), and this shows that this plants eat a lot. There were even some insects captured in the flower stalks which are also covered with sticky glands. At 10:30 in the morning, Heberleyn took the temperature again and it was at 18.3 celsius degrees. This means that the higher temperatures here won´t get over 20 celsius, and as I wrote before, will get down to the freezing point during the coldest nights of the year. At 11:00 our journey was over as I had to go back to Bogota or I would miss my plane to Medellin. Thankfully, the trip was a full success as I could not only see the plants, but could also watch them in bloom and take some nice pictures. I want to thank Heberleyn for taking me to this fantastic experience. Following, some more pictures for you all to enjoy!! A nice group of two blooming plants. the two types of leaves. 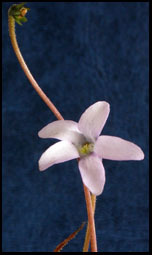 Side view of the flower. More wonderful journeys in the future.